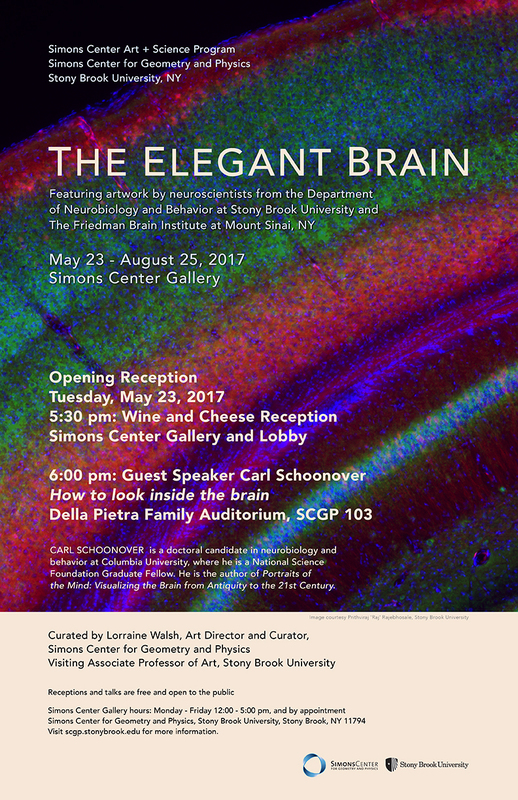 The Simons Center Gallery is pleased to announce the opening of The Elegant Brain, a group exhibition featuring artwork by neuroscientists from the Department of Neurobiology and Behavior at Stony Brook University and The Friedman Brain Institute at the Icahn School of Medicine, Mount Sinai, NY. Art and science readily come together in The Elegant Brain exhibition. The dazzling images of neuronal networks are not only beautiful but paramount in their ability to reveal the structure and function of the brain. Working today with a sizable palette of fluorescent stains and the latest technological advances, scientists are making the unseen visible for a deeper understanding of the brain and by extension the mind. The artwork features stunning landscapes of the brain’s architecture that in itself offers a remarkable visual aesthetic experience, providing yet another example of the exquisite complexity in our vast web of neural connections. The Elegant Brain exhibition also honors the recent partnership with Stony Brook School of Medicine and Mount Sinai Health System. In August 2016, it was announced that these two institutions commenced an affiliation agreement to include collaboration on research, academic programs and clinical care initiatives. The partnership was launched to heighten academic and research synergies to promote discovery and achieve breakthroughs in understanding and treating disease. Carl Schoonover is a postdoctoral fellow in the Axel Laboratory at Columbia University. He is the author of Portraits of the Mind: Visualizing the Brain from Antiquity to the 21st Century, and has written for The New York Times, Le Figaro, and Scientific American. Schoonover co-founded NeuWrite, a collaborative working group for scientists, writers, and those in between. His radio program on WKCR 89.9 FM, focuses on opera, postwar classical music, and occasionally their relationship to the brain.